Whether by age, tooth decay or even a dental injury, tooth loss happens to the best of us. Missing a tooth affects each patient’s health and self-esteem in different ways, but one thing stays the same: without restorative help after tooth loss, your oral health deteriorates and may lead to the development of oral health risks such as a change in your bite, jaw pain, TMJ disorders or further loss of teeth. If you have lost a tooth, visit your dentist for a consultation about restorative dentistry. Using a custom denture, dental implant or dental bridge, Dr. Satvat will help you achieve the ideal smile you were meant to have to support your overall health. Call us at (310) 395-1810. Dental bridges are a popular, nonsurgical form of tooth replacement that use one or more dental crowns (known as replacement teeth or “pontics”) to fill the spaces of missing teeth and “bridge” the gap where tooth loss has occurred. At Brightleaf Dental, Dr. Satvat uses lifelike and beautiful zirconia bridges to effectively restore your smile. Rather than place metal in the body (as is typical with a traditional bridge) she prefers to use zirconia bridges, which are formed of a strong dental ceramic that is compatible with the body. Minimal tooth reduction is needed to place zirconia crowns compared to similar forms of dental restorations, and your new crowns will blend in effortlessly with the rest of your smile. Your teeth are meant to work together. After tooth loss, uneven pressure is placed on the rest of the teeth, including the opposite side of the mouth. Surrounding facial muscles undergo unnecessary strain and may cause headaches and chronic pain in your temporomandibular joint, also known as your TMJ. To protect your smile from a change in your bite and other dental issues, consider replacing one or more missing teeth by consulting your dentist. Although dental bridges share many similar benefits to tooth replacement with a dental implant, they are not the same. Ultimately, the dental restoration that is best for you depends highly on your unique dental situation. To determine what form of tooth replacement is right for you, schedule a consultation with your local dentist in Santa Monica. Your dental implant process begins by carefully re-contouring the teeth where the bridge is needed by removing a small film of enamel. This allows for enough room to exist to place the dental crowns in a way that looks and feels natural. 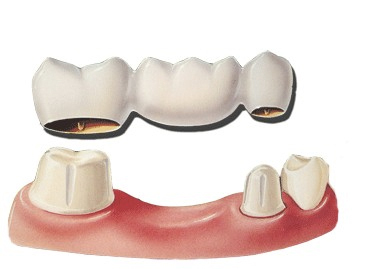 Teeth impressions are made, which serve as a model for creating the bridge and dental crowns. Once placed, your new smile will feel comfortable and look just like your natural teeth. Dental bridges can last an average of 10 years to as long as a lifetime with proper care by brushing and flossing regularly, keeping your bridge clean and coming in to see your dentist every six months. Avoid chewing hard substances such as ice or non-food items and call your local dentist if you have noticed a change in your bridge or dental health. At Brightleaf Dental in Santa Monica, Dr. Satvat provides exceptional care in modern restorative and cosmetic dentistry and strives to find the best dental solutions for each of her patients and their unique dental needs.